Syrmia (German: Syrmien; Serbian: Srem, Croatian: Srijem; Hungarian: Szerémség) is a historical landscape between Danube and Sava which reaches from the Croatian city of Vinkovci in the west to the Serbian capital Belgrade in the east. Two thirds nowadays belong to the Serbian province of Vojvodina, one third lies in Croatia. The Serbian part is mostly inhabited by Serbians (80%); Croatians, Hungarians, Slovaks and Russians are the largest minorities. This cultural diversity is due to many historical migration waves: Around 1690, a Serbian patriarch fled with thousands of Serbian families from southern Serbia to Syrmia. In 1714, Karlovci was built as their metropolis and intellectual and cultural centre of Serbian Orthodoxy. Various monasteries in Fruška Gora still reflect that “great journey” of Serbians. In 1745, large parts of Syrmia became part of the military border. The cities were settled by German-speaking militaries, tradesmen and craftsmen. In many villages, Slavs were used as armed peasants and only few areas remained private property. Among the private owners were the Ruma family who belonged to the House of Pejačević . They recruited settlers – Germans, Hungarians, Serbians and other Slavs. All settlers shaped the region strongly: they brought their culture’s food, languages and traditions. Many people spoke several languages. The centuries of peaceful cohabitation was endangered by World War I and completely ended with World War II. In 1941, Syrmia was given to the Independent State of Croatia and the fascistic Ustaša Regime persecuted Serbians, Jews and Roma. Fruška Gora became an area of retreat for the partisans which made Syrmia an important centre for the guerrilla fights. From 1944 onwards, Red Army and guerrilla could advance unhindered. Most of the Danube Swabians were able to flee Syrmia in time. Almost all remaining Germans were interned and thousands died of hunger, disease and cold. Today, around 4.000 Germans still live in Serbia. From the 1990s onwards, they began to get organised in associations. Memorials in Mitrovica and other places commemorate the Danube Swabians who died in the camps. Many migrants were farmers. 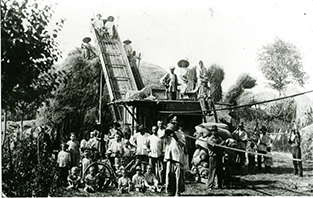 Here, they can be seen during hay making. 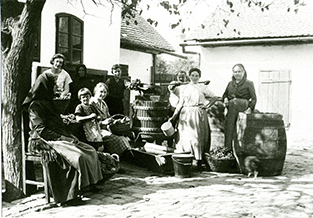 The whole family used to be involved in the processing of grapes.